In her portrait series Invisible Hands: Eleven Million, artist Hedy Torres recognizes and elevates the undocumented immigrants living in Los Angeles. Developed through various media, including charcoal on paper, digital drawings, and interviews, the resulting large-scale oil portraits are painted in a monochromatic grayscale. 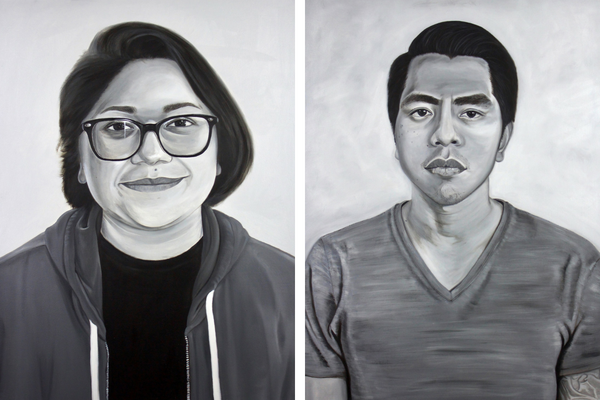 Gray serves to place the subjects in limbo and depict the isolation these individuals experience because of their immigration status, many of whom are DACA recipients, while simultaneously challenging the assumptions of ethnic and racial categorization and stereotyping that often occur because of an individual’s physical appearance. Images (left to right): Hedy Torres, “Sometimes, I feel that everything is against me.” Oil on canvas, 36” x 48”, 2017. Hedy Torres, “I feel very blessed to live in America.” Oil on canvas, 36” x 48”, 2017.